Attucks, Reavis and Tarkington recieved a special visit from some great volunteers from Bank of America at this past Friday’s Game Day. Gerund, Chris and Victoria dived right into team stretches with Tarkington and got their heart pumping with a few rounds of Junk Food Tag. Once all of the schools were ready to play some soccer Gerund, Chris and Victoria took their positions as field captains. They cheered our kids on, made sure they worked on their Sweet Spot passing and Open Space. Once the games wrapped up and our Bank of America Volunteers got their chance to meet kids from Attucks, Reavis and Tarkington they gathered at center field and talked about the Week Seven Work to Play character lesson, Self-Esteem. Soccer players shared why they felt good about themselves as a student and as siblings. They also shared why it’s important to make others feel good with compliments and encouragement. After their discussion, the teams enjoyed their healthy and nutritious apples and Quaker Chewy granola bars that were generously donated by Bank of America. 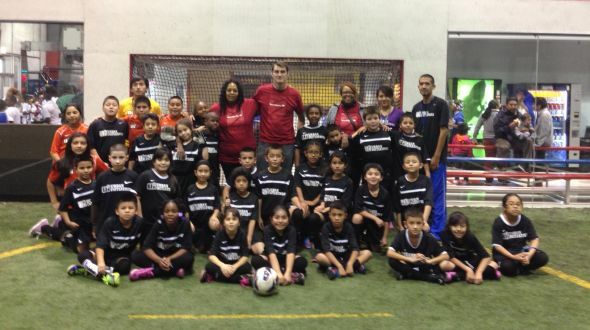 Urban Initiatives would like to thank Gerund, Chris and Victoria for giving our kids a very special Game Day experience!